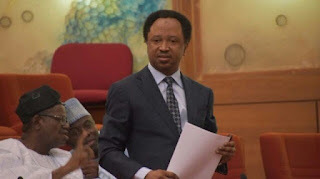 The lawmaker representing Kaduna Central, Senator Shehu Sani, has warned that the humiliation of the Senate President, Bukola Saraki, the All Progressives Congress, APC, the national leader, Bola Tinubu, by the federal government, will make tough the re-election of President Muhammadu Buhari. He stated that the ruling APC failed to accord Saraki and TInubu the respect they deserve for their contributions to the 2015 victory of the present government. Recall that Senator Oluremi Tinubu, wife of the national leader of the APC, Asiwaju Bola Tinubu, had stated that her husband was, “trashed” after the party won the 2015 elections, adding that the former Lagos governor was sidelined despite his efforts towards ensuring that APC won the polls. Speaking with Saturday Sun, Sani said, “I must be frank with you, Tinubu has endured a lot of humiliation under the present administration. He was never much consulted, never much recognised as somebody who sacrificed his energy, time and resources to bring the party to where it is.